I went to previous Crusades, and am finding quite a few that I would like to try. Here is the "Irresistable - Wax rubbings" challenge...my version of it. I used the Anaglypta Wallpaper which is textured paintable wallpaper as my 'stencil' for rubbing. The papers are gorgeous, more than my pictures show. I used 8 different patterns on lightweight columnar pad, light fabric paints, and of course crayons. Easy peasy backgrounds. Give it a try. Here is a scan of the right page - cannot seem to get a good image at all...sigh. Click on the pics for a larger image - it does help! love these colours soft and full of light !!! Oh I like what you have been creating lately Daphne. I would love to try the wax paper resist too and may try that this weekend. Lovely colours you are using and well just love your artwork. It is inspiring! 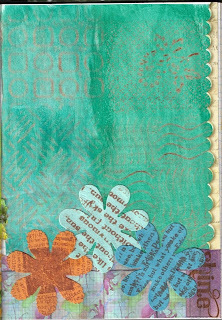 I'm SEW in love with your blog--these rubbed pages are fantastic! Just joined up to follow your blog, and I'd love it if you might return the favor. Your altered book pages are amazing--I'm assuming you are in ISABA? Super background, Daphne! That wallpaper is great. Wish I had some. And yet another lovely piece with a great background, and flowers, love it Daphne! Just looking at your blog tonight has me inspired to play for a while, thank you! Obviously, I am feeling far better than I was over the weekend, thank goodness. Daphne - bravo for digging up an old crusade and giving it a try! Rubbing anaglypta is one of my faves! Glad you enjoyed it - lookin' good! Thanks for sharing! Beautiful backgrounds for your work. Just lovely.